This is the largest room in our home. It has 25′ ceilings and is divided into two sections, one side is our family room and television viewing area and the other side is where our pool table is kept. We started by getting the floors redone, as well as the pool table. We had the table stained a darker color, got new bumpers and new felt (camel) installed. As you can see, it is as if we got a brand new table. 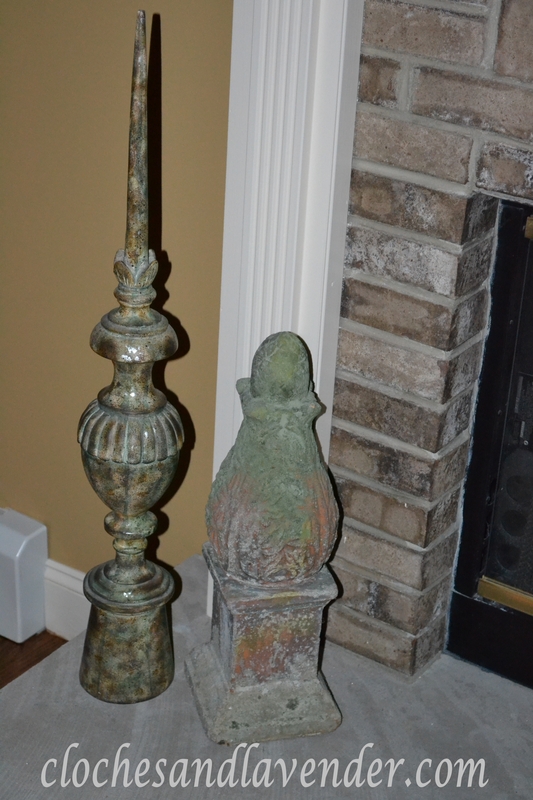 We think it is gorgeous and very rich looking and goes great with our new floors and the rest of our furniture. 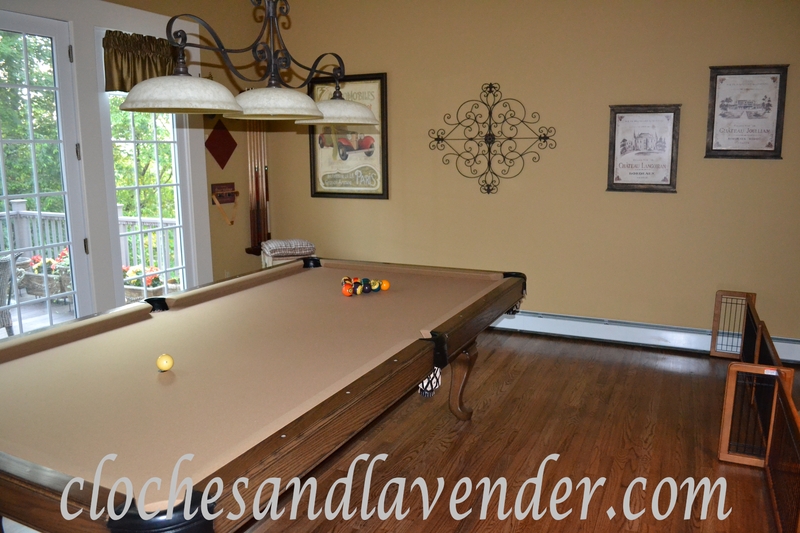 The Pool Table is open to the kitchen area. We then added a few things and added some new features. 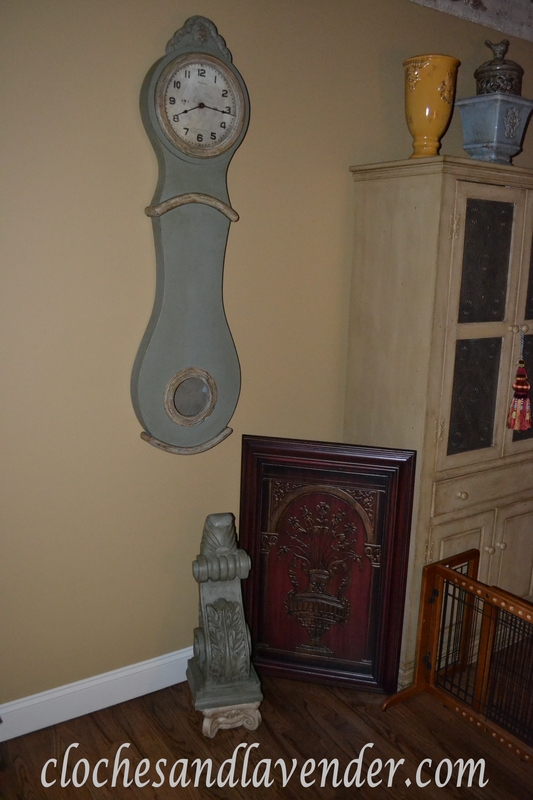 Two of the accessories I have spoken about; my Mora clock which I just love, it is a perfect complement to the room along with my corbel. I grouped them with this piece of artwork I had stashed away to form a nice vignette. All these we placed next to our coffee bar that I spoke about in a prior post as well. You may also notice, in the corner, the vintage trunk that I got at a last-minute sale; it is housing our firewood and our peat that we will burn this coming winter. We love the soft aroma the peat gives the fire. 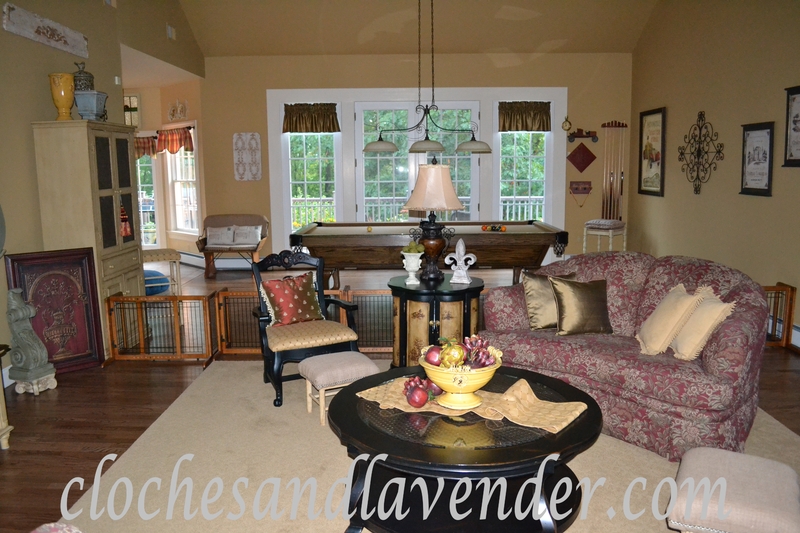 We love this room for gatherings, watching television and sitting in front of the fire. We really enjoy our fireplace during the cold months. 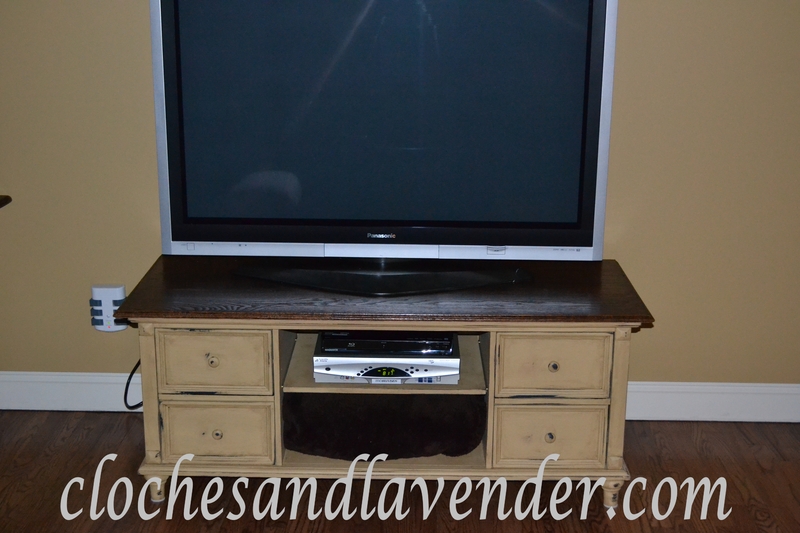 Our TV cabinet was a bargain I found online, it was black MDF and I thought I would do something to it. 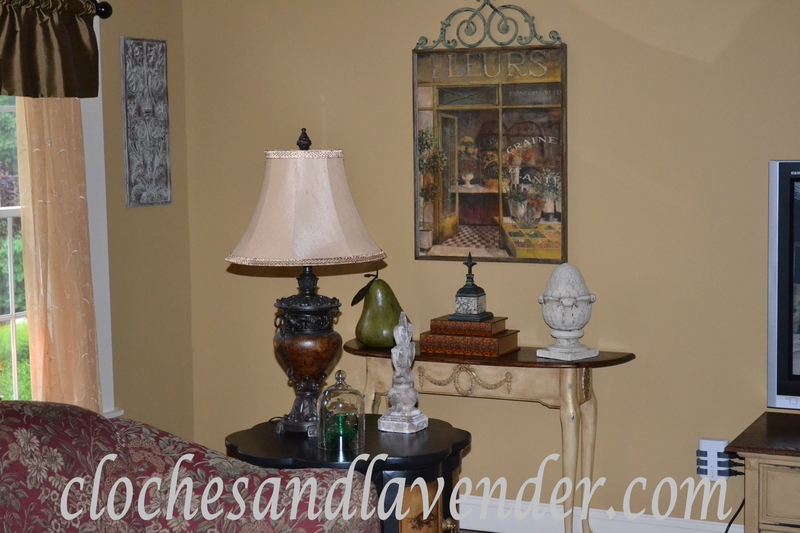 I decided to paint it the same color as the walls (Mannered Gold) and then sand in areas to give it that aged look. John made me the oak top and I stained that with min-wax provincial. I love the way this turned out it looks like and expensive cabinet now when it was dirt cheap. 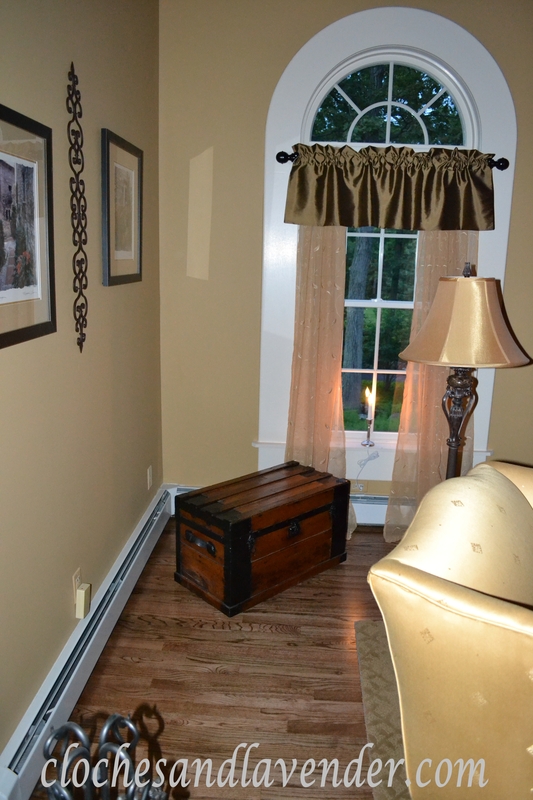 There is a yellow table in the corner of the room that we totally redid a few years back now. 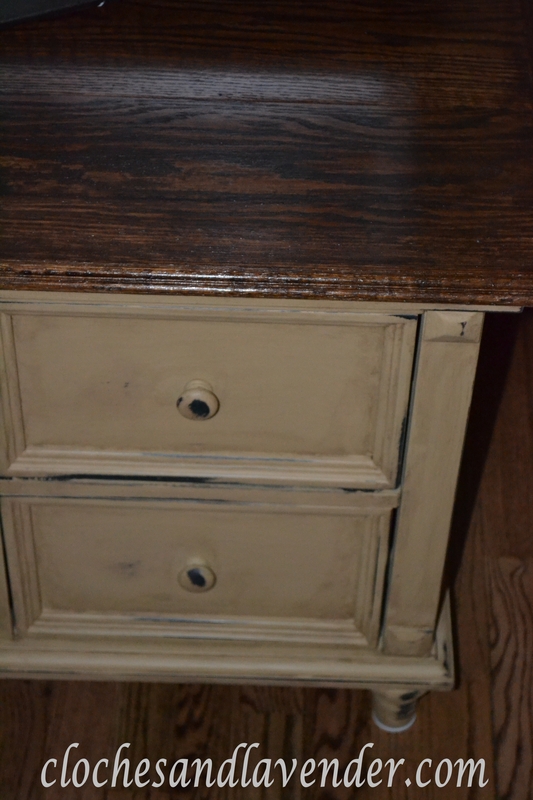 It used to be a country green table with straight legs and a drawer. I try to repurpose as much as I can so we changed out the legs and took the drawer out since it was shallow and didn’t store much inside. We added plywood to the front with appliques and then I painted it black and rubbed wax from a candle (a trick I learned from HGTV) on the black paint and used the same color that is on the walls (Mannered Gold) and then I sanded areas were I put the wax so the black paint would pop through here and there. I then used a raw umber glaze to age the piece and I painted the appliques with gold metallic paint and aged them as well. 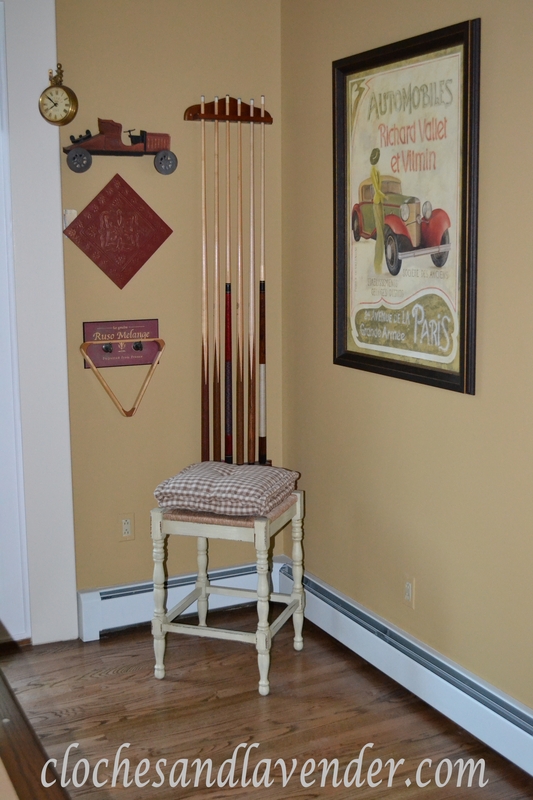 We did most of the things in our family room ourselves except for the floor and the pool table. 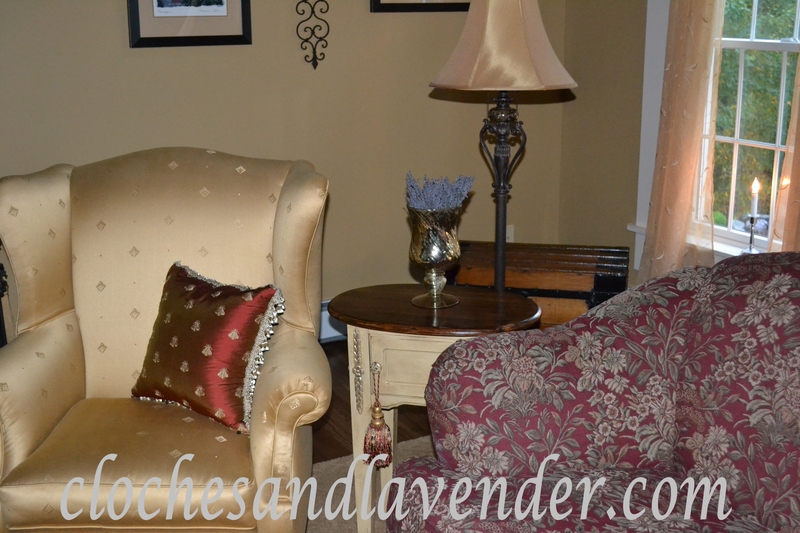 We are people who believe in repurposing furniture when we can we think it is a good way to save money and I enjoy doing the makeovers. Here are some various shots around the room “after”. Really turned out lovely! Everything looks great! I love your repurposed possessions! And that clock is truly wonderful. Well done! Thank you so much I love it and I am very happy. 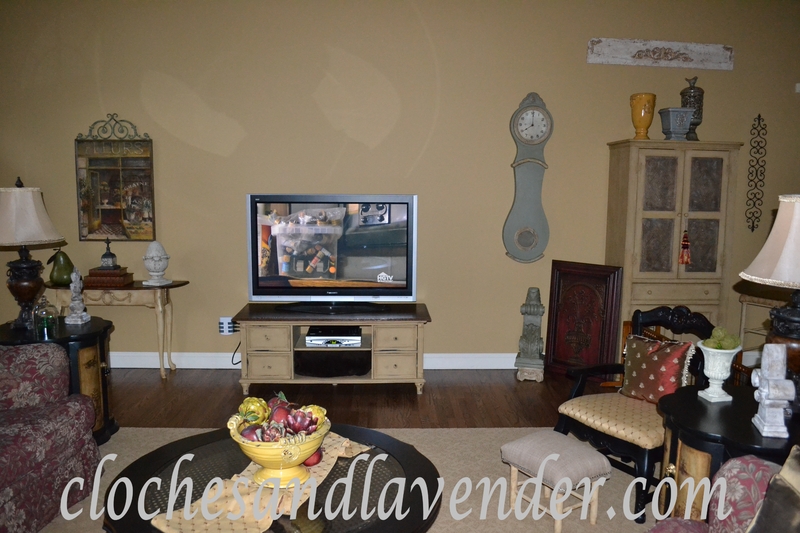 I love the wall color and it looks great on the t.v. cabinet. I’m all about repurposing and restoring. So, I really appreciate all the work y’all put into your living room. The clock is beautiful. 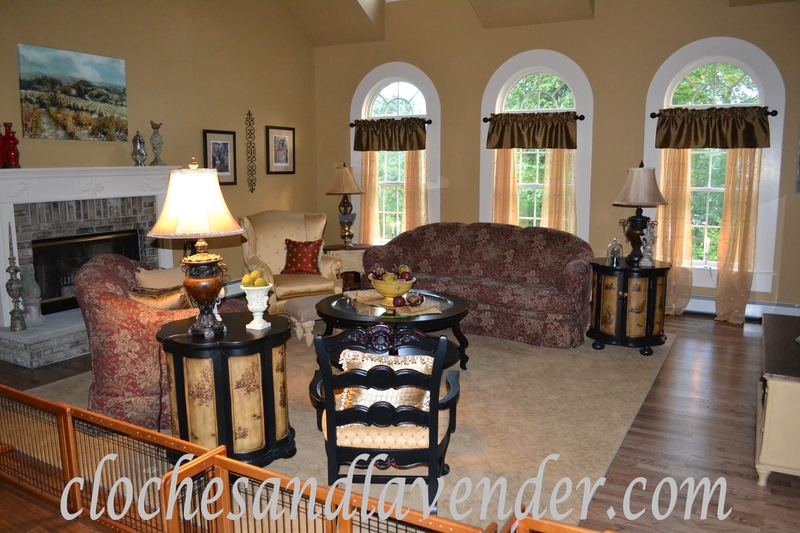 I love the curved love seat, too. I’m wanting one to use in the breakfast room to provide comfortable seating around the table. I’d love to curl up on yours and enjoy the fire in your cozy living room. You’ve created a very warm and inviting space. I can see how y’all would enjoy spending time there. The couch by the table sound like a gret idea. I like that a lot. 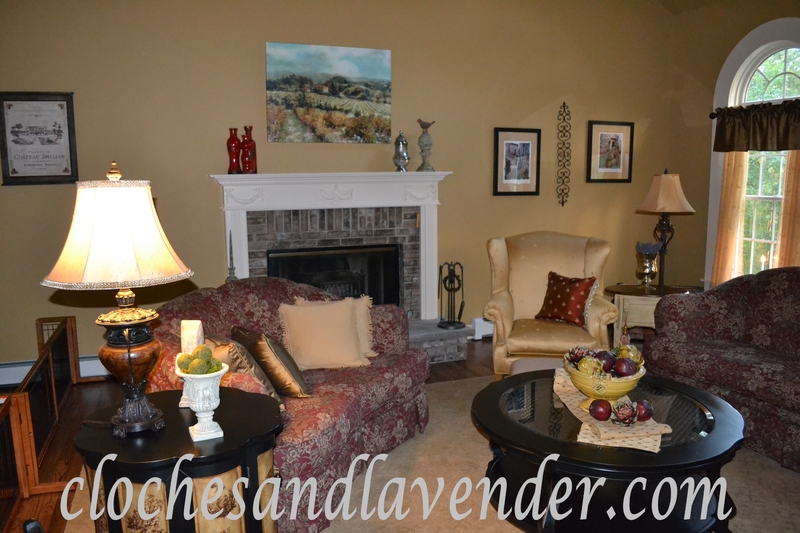 We tried to make a large room feel warm and inviting and I am happy. I always say repupose first there is always paint and fauxing for me with furniture. Thank you I love the way it came out too. It is such a wamr room. 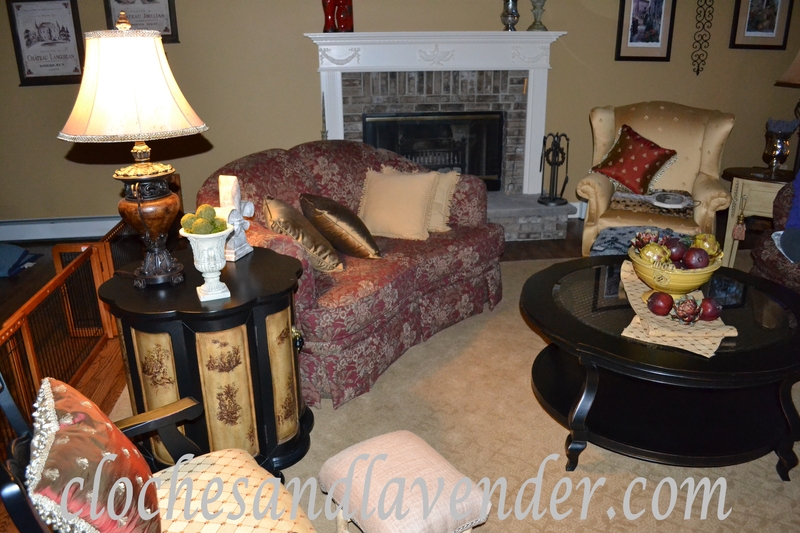 You deserve it you are not afraid of repurposing furniture and color!! I check you blog almost everyday. Thank you we love it very much. 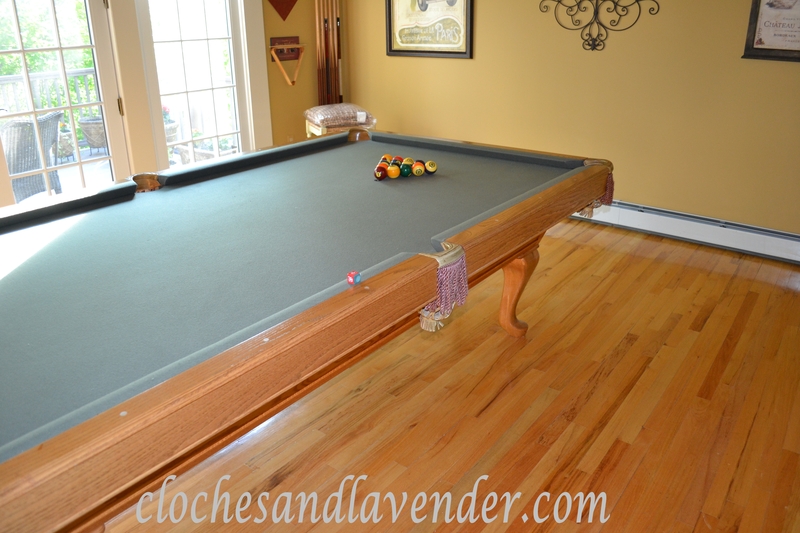 I love the new floor color, and the pool table looks great in the new colors you chose for the finish and the felt. It is a very inviting room. 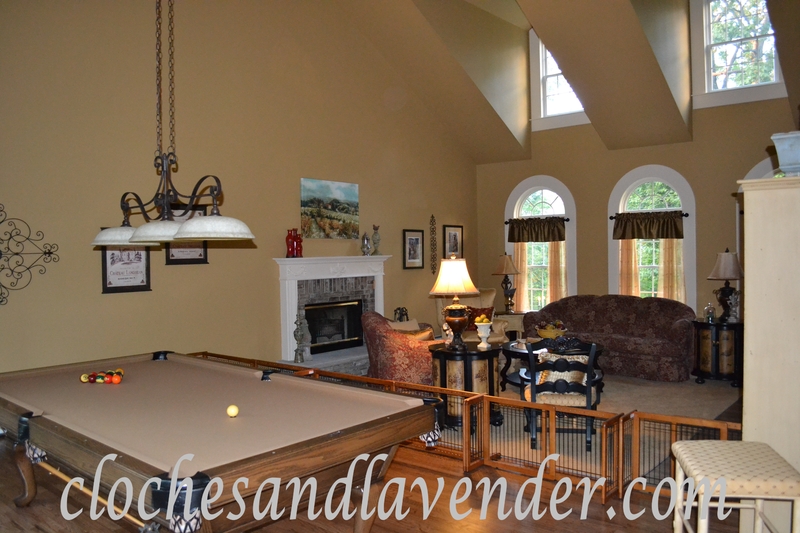 A beautiful room….I really like the change in the pool table…blends in very nicely with the entire room….and I am so loving that Mora clock!….What a terrific room to gather in as it is so warm and inviting! Thank you for your kind words. I love how everything turned out. Such a beautiful room! The floors came out so nice and the pool table looks brand new!